Research suggests that 50% of valuable business information and files are stored on individual employee computers. That is a huge amount of important business insights and possible ideas that aren’t available to other people inside your company or your business partners and clients outside of your company. There they are locked away on individual computers. This is why we are excited to announce Onehub Sync. Onehub Sync makes it easy to unleash the files and information stored on individual computers by creating a link to your Onehub workspaces in the cloud. This way you can not only share files and collaborate with people inside your company but also outside your company. It makes information sharing with external partners and vendors or even customers seamless and easy. By connecting your computer to the robust collaboration tools offered in Onehub Workspaces you can more productively and efficiently work with people inside and outside your firewall. Want to see it in action? Watch this short video. You download the Onehub Sync client to your computer and install. A Onehub folder will be created in your “Documents” folder. You can determine which Onehub Workspaces you would like to sync and turn them on in the Onehub application. When you put files into the Onehub folder on your computer it continuously syncs those files to your client extranets, partner portals, or internal department intranets on Onehub and vice versa. Everyone gets notified via email of new files and changes that are synced so you’re always on the same page. Onehub Sync provides a seamless connection from your computer to the cloud and from your office to others around the world. 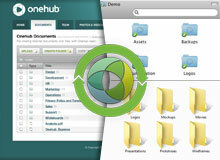 We are happy to have Onehub Sync applications available for both Mac and Windows. We will be releasing these to our customers over the next few weeks.We look forward to hearing your feedback about this great new feature. If you are a customer and would like to try Onehub Sync, please contact us at info@onehub.com or 1-877-644-7774.